Amid or subsequent to a period of conflict or repression, acknowledging victims’ need for justice via compensation in both a symbolic and actual way is an important means through which the state can take some form of responsibility for the violations that it either committed or failed to prevent. Providing reparations, as defined in United Nations General Assembly Resolution 60/147, can take five primary forms: (1) restitution, meant to restore the victim to his or her original situation before the violation took place; (2) compensation, which is payment provided for any “economically assessable damage;” (3) rehabilitation, which includes medical and psychological care, as well as legal and social services; (4) satisfaction, which can take a variety of different forms, from public apologies to commemorations; and (5) guarantees of non-repetition, which include measures that help bring to a halt future violations. Reparations can also be provided individually or collectively. They may be brought about as a result of court orders, administrative or legislative decisions, or written into peace agreements. 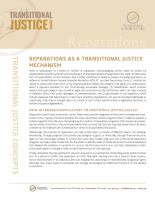 How Do Reparations Satisfy Transitional Justice Goals? Reparations, which tend to be victim-centric, help underscore the obligation of the state to compensate a particular victim or group of victims, whether the state committed violations against them or failed to prevent a violation against them. Because the designing and creation of reparations programs often involve documenting the names of victims or the particular events that occurred, this process may help reveal the truth about a certain set of violations and contribute to a sense of accountability and justice. Additionally, the provision of reparations can help victims heal in a variety of different means—for example, emotionally, through programs that provide psychological support; or financially, through financial aid packages for the school-age children of victims who have died. Finally, long-term and institutional reparations programs can help create momentum for the state to identify areas of institutional and structural weakness that allowed the violations in question to occur in the first place and in turn, can help stakeholders understand what needs to change in order to halt violations and to curb impunity. Finally, amnesties granted for persons accused of or punished for committing purely political crimes prior to a period of conflict and repression can often help right a wrong and undo a previous false prosecution or imprisonment of an individual who was targeted for exercising his internationally recognized rights. Although rare, these types of amnesties are strongly encouraged by Additional Protocol II of the Geneva Conventions. What Are the Downfalls of Providing Reparations? Although a well-crafted and comprehensive reparations program can contribute significantly to the trajectory of transitional justice in a society, these forms of compensation are not immune from shortcomings. One of the most severe limitations of some reparations programs is their failure to take into account the needs and wishes of victims in a consultative process, as well as to take into account the specialized needs of different victims. The types of reparations that are appropriate may vary depending on the type of violation undergone, and the victim’s socioeconomic status, gender, location, or identity. Transitional justice research indicates that many reparations programs fail to appropriately incorporate the voices of marginalized groups like women and children. Reparations programs are, like any government initiative, also subject to bias. While it is impossible to compensate every single individual who may claim to be a victim, the designation of victims—if not conducted via a fair and transparent process—may lead to further marginalization. Following a period of conflict or repression, victors emerging from such a period may end up creating reparations programs that reward victims aligned with them and that arbitrarily discriminate, for example, against others of a particular political affiliation—leading to a situation in which not all victims are recognized or appropriately compensated and in turn, a lack of justice and a festering sense of impunity. Finally, reparations programs that are not sufficiently resourced are much less likely to address the gamut of victim needs. Budgets for reparations programs have, in some cases, competed with budget line-items meant to address poverty, unemployment, and other socioeconomic and developmental challenges. Accordingly, reparations programs that are not appropriately budgeted for or sufficiently financed may end up implicating or being implicated by non-reparations programs targeted at other marginalized groups. How Do We Measure the Success of Providing Reparations? As conceived of by the United Nations, one measure of success for a reparations program can revolve around its “completeness”—in essence, the notion that every victim who meets the criteria laid out by the program is compensated. The completeness of a program is dependent on the amount of information available about the violations and their victims, the participation of victims in the process, the outreach conducted in order to advertise the presence and details of the program, the level of access to benefits promised by the program, and the evidentiary threshold through which victims are designated. On a broader level, however, both the process and the results matter as much as “completeness.” Decisions about who was classified as a victim, which types of violations were covered, and which benefits were provided are instrumental in determining whether a reparations policy has effectively addressed victims’ immediate needs and whether it will lastingly contribute to a systematic sense of justice over the long term. “Basic Principles and Guidelines on the Right to a Remedy and Reparation for Victims of Gross Violations of International Human Rights Law and Serious Violations of International Humanitarian Law.” United Nations General Assembly Resolution 60/147. December 16, 2005. https://www.ohchr.org/EN/ProfessionalInterest/Pages/RemedyAndReparation.aspx. International Center for Transitional Justice. “Reparations.” https://www.ictj.org/our-work/transitional-justice-issues/reparations. Office of the United Nations High Commissioner for Human Rights. “Rule-of-Law Tools for Post-Conflict States.” https://www.ohchr.org/Documents/Publications/ReparationsProgrammes.pdf. United States Department of State. Transitional Justice Initiative. “Reparation” (policy paper). May 16, 2016. https://www.state.gov/documents/organization/257774.pdf.